For those who always wanted to know everything about Giancarlo Baghetti but were afraid to ask: here's the Baghetti FAQ! Who was Giancarlo Baghetti anyway? An Italian, born in Milan in 1934. He started his career in 1956, by participating in the Coppa Madunina, in Monza, driving an Alfa Romeo 1900 TI. In 1958 he finished second with that car in the Mille Miglia (by then a rally). In 1959 he started racing Formula Juniors whilst his best result was a second in the Coupe du Salon de Paris driving a Fiat Abarth 750. By 1960 his results on the Formula Junior were improving, with some victories added to his tally. He also was selected as member of a group of drivers who attempted (and obtained) the 72 hours non-stop World Record in G class (cars with engine from 751cc to 1100 cc), driving a Fiat-Abarth 1000. These people managed to do the trick of completing 13.441 (and a half) kilometres in 72 hours. Wow! Then what happened in 1961? If the agreement was to run Baghetti in non-championship races, how come that he appeared at the French Grand Prix? A couple of factors, but mainly a combination of two: Baghetti's excellent results and Olivier Gendebien returning to the Emeryson in the Ecurie Nationale Belge project, thus freeing his yellow Ferrari 156 65-degree chassis 002 against all odds...The car was promptly repainted red and given to the promising newcomer. This car was the one that Baghetti would drive for the rest of the season. From France onwards, the entrant would be Scuderia Sant'Ambroeus, the team deciding to capitalize on the success of their pupil. How the hell did Baghetti manage to win the French GP? Well, plain and simple really. It was just a case of hanging on. The miracle was helped on its way to becoming reality by the seering heat, for which many an engine had to pay its price on the high-speed track of Reims-Gueux. And even the tarmac couldn't withstand it! After Ginther had dropped back after being hit by Surtees (the American had himself to blame for he spun at Thillois trying to stay ahead of Monaco winner Moss), Trips' 156 was the first to let go, his engine boiling. Poleman Hill took over but he spun over the breaking tarmac (again at Thillois), Phil caught into a stall. Now his countryman and team mate was back into the lead but his oil pressure soon dropped to zero. So, each of the three works Ferraris, which had monopolised the front row, had fallen by the wayside, an unusual occurrence for the dominant team of the season. This left Baghetti, who started from 12th position on the grid, battling with the Porsches of Gurney and Bonnier, the three of them going at it hammer and tongues over Reims' famous long straights, in one of the sport's greatest slipstreaming duels. They had been doing so all race but suddenly it was for the lead. With three laps to go, Bonnier had to let go of the leading duo with engine trouble, so at the end only Baghetti and Gurney remained at the front. There was literally nothing in between them. Whatever the outcome, this year's French Grand Prix would have a surprise winner: Baghetti was the darkest horse in ages leading a World Championship event, while Gurney could be the one to give Porsche a shocking debut season victory after the German marque had dominated F2 with their 718 for the past few seasons. At Thillois, the last corner of the triangular Reims track, Gurney dived through into the lead, the American seemingly taking his revenge for the humilation at Syracuse. But a magic lunge on the final finish straight saw Giancarlo fly past the Porsche, beating it across the line by a tenth of a second, keeping up Ferrari's unbeaten run since Zandvoort. Mind you, that's one tenth of a second in sixties terms. With today's means of time measurement it would have been a lot closer! It was a huge upset to see the No.50 car win. Sure, Baghetti had been helped by the mishaps of Hill, Ginther and Trips but once he found himself in a winning position he had victory come his way by his own doing. That last pass was timed to perfection and had left Gurney without answer. The American and Porsche had to wait a year and six days before they - at the next edition of the Grand Prix de l'ACF - could enjoy the sweet taste of victory. So Baghetti won 3 Grands Prix, one of them of Championship status, right? No, there was another victory, although of very minor importance. At the end of the year, on 12th October 1961, the most obscure of all the 1.5-litre F1 races took place in Vallelunga. It had a strange origin, this so-called Prima Coppa Italia. The Italian championship for drivers was tied between Bandini and Baghetti. So the Scuderia Sant'Ambroeus had the funny idea of organizing a decider at Vallelunga when it was known that Bandini would be elsewhere! Unfortunately, plans went a little awry because Baghetti's Ferrari was not available... But they were able to borrow a Porsche 718 (202) from Ecurie Nationale Suisse and the title was safe for young Baghetti, after winning both heats from Scuderia Dolomiti's Lotus 18 (913) driven by Ernesto Prinoth and Nino Vaccarella at the wheel of a Cooper 51 (F2-1-59). So the answer is...four! And what happened after France? Two more entries were arranged for him by SSA, one for the British GP, run at Aintree, where he crashed in the rain on lap 27 whilst running 11th, and the other for the Italian Grand Prix at Monza, for which he qualified 6th but broke the engine on lap 13 whilst running third. By the way, he also managed to obtain fastest lap in this tragic race. So he was taken as part of the Ferrari squad for 1962. How did he do? Not bad considering the circumstances. The '62 season was a perfect disaster for Ferrari, and the best results they obtained were Mairesse's win in Brussels at the start of the year and Baghetti's second place in the Mediterranean Grand Prix in August. In the Championship, Phil Hill was on the podium in the first three races, Baghetti got a fourth and a fifth (from four entries) but Enzo Ferrari's policy of making the young guns fight for the place meant that old rival Lorenzo Bandini got the psychological advantage over Baghetti, not to mention the Ricardo Rodriguez effect. 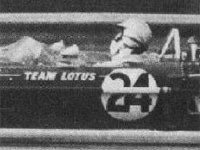 By the end of the year Baghetti was tempted into the ATS project with all the angry-at-Laura Ferrari staff, and that was really the wrong move... That was before accepting Bandini's position in the Scuderia Centro Sud for 1964. That was the end of his involvement with Formula 1, although he would be invited as a "local hero" in the Italian Grands Prix of 1965, '66 and '67. These three occasions were quite pathetic, to say it mildly, Baghetti being entered by Brabham in 1965, by Reg Parnell in 1966 (with a little help of the Ferrari factory, by means of the loan of... Bandini's spare 246-0006!) and finally by Lotus endorsing him the spare 49-R1 after doing the same with Wietzes in Canada and Solana for Watkins Glen. So what really happened to him? Baghetti was a virtually unknown FJunior driver when he was entered at the 1961 Syracuse GP. He had hardly ever ventured outside of Italy and his best results in the category comprised two wins at Monza against mainly negligable opposition in early 1960. When placed against the cream of European FJunior drivers he usually slipped down the order, like at the Lottery GP at Monza and the Pescara GP, where he finished 17th and 10th respectively, but his big breakthrough came in December when he won a race at Monza organised by the FISA to promote young Italian talent. His prize was a drive in the first rear-engined Ferrari, first seen at Monaco 1960 driven by Richie Ginther and now fitted with one of their 65° V6 F2 engines. This car had been used as a testbed for the new F1 car and won two out of three F2 races it was entered in. By April 1961 it had acquired the classic body with the "shark mouth" and was the only Ferrari present in Sicily when the works F1 car proved to be not ready yet. The opposition was first class: two works Porsche, BRM and Lotus cars each and a single works Cooper in the hands of World Champion Jack Brabham, plus a selection of well established privateers including Stirling Moss in the latest Walker-Lotus. In fact it was virtually a WC round field. 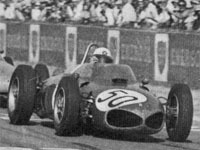 Baghetti was slowly learning his ways and after qualifying on the front row moved into the lead on lap 6 and held off Dan Gurney for a famous win, which was mainly attributed to the car. But three weeks later three factory Ferraris could not stop Moss from winning the Monaco GP, while on the same day Baghetti scored his second F1 triumph by trouncing a field of privateers at the Naples GP. So when Baghetti was entered in the French GP he was still unbeaten while Ferrari, even with the new 120° engine was not, although the car was clearly regarded as by far the best around. In the end all three works cars qualified on the front row and ran away with the race, that is until they hit trouble. And all of a sudden the privately entered car of Baghetti, a year-old experimental chassis with an even older engine and a rookie at the wheel was battling it out with the two works Porsches for the lead in the most prestigious race of the year! His luck held and the fairy-tale ending was perfect, but from the moment this picture was taken it went decidedly downhill for this young Italian. At the wet British GP a fortnight later he spun out of 11th position, just as he was about being lapped. Finally beaten, he was presented with the car Phil Hill had campaigned all year (the winner of the Belgian GP) for his home race, the Italian GP, where he ran fourth before retiring but set fastest race lap. A month later he won an obscure Italian Championship race that happened to be open for F1 cars at the wheel of an ex-works Porsche. He was then being promoted to the Ferrari factory team, finishing fourth at the Aintree 200 and again at the Dutch GP, where he was lapped for the first time in his F1 career after escaping this fate so closely at Aintree twice before. Of the rest of his career, the least said is the better... OK, let's coax out some more words! After three disastrous seasons in F1, driving for Ferrari, ATS and Scuderia Centro Sud consecutively he couldn't find a regular drive so he had to fall back to sports and touring car races, where his best result seems to have been runner-up in the 1966 Targa Florio, sharing a works Ferrari with Frenchman Jean Guichet. Back to Baghetti and his last hurrah in single-seaters. By now he was a regular in the Italian F3 Championship and finally got himself into a works Ferrari again. That was June 23, 1968: the Lottery GP at Monza again. Along with fellow F3 hotshoes Derek Bell, Tino Brambilla and Mario Casoni he was given the chance to drive the hitherto unsuccessful F2 Ferrari Dino 166. He qualified comfortably slowest of the quartet and ran midfield until a massive pile-up at half-distance eliminated the whole Ferrari effort. Baghetti walked away and turned to journalism for the final 27 years of his life.